Pitchfork kicks off your weekend in style with a premiere of “Midwest” from DIVINE CIRCLES’ debut offering, Oblivion Songs. DIVINE CIRCLES is a vivid solo venture from USX violin manipulator Meghan Mulhearn. 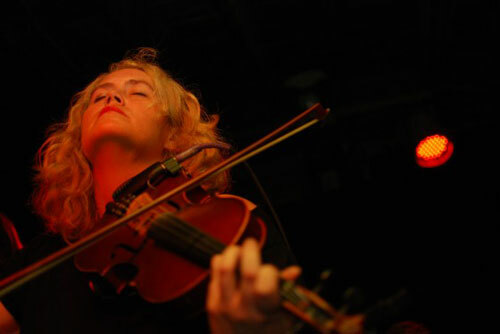 Known for pushing the limits of traditional string playing in an effort to explore the violin’s potential as an instrument far beyond orthodox composition, Mulhearn utilizes effects and electronics, novel techniques in plucking and strumming and uses the violin as a vocal resonator. Her eccentric approach, often compared to Godspeed You! Black Emperor, Warren Ellis of Dirty Three/Nick Cave and the Bad Seeds and more experimental artists such as Aidan Baker and Steve Reich, conjures evocative, visceral and textural elements, often unrecognizable as originating from a violin at all. Breathe deep to the resonance of “Midwest” now playing at THIS LOCATION. Oblivion Songs was recorded at Fahrenheit Studio with Travis Kammeyer (A Storm of Light, USX, Generation of Vipers, This Mountain, Ocoai), mastered by James Plotkin (OLD, Scorn, Khanate, Khlyst) and is out now on limited edition vinyl via Paradigms Recordings. Order your copy today HERE.